Every blogger needs a place where can share his thoughts and stories among the audience. Today there are more options available – you can sign up to a Medium account or you can create WordPress blog. But honestly, to have your own author website is always a better choice. Why it is so? This article was updated in 30th of October 2018 with the latest information about pros and cons of creating WordPress blog using WordPress theme for writers. We’ll introduce you our Multi-Author Blog theme with features you won’t find in any other themes for authors & bloggers. Also we’ll advise you how to use Google Map element to place and display specific post on map – for showing your readers the place about whom was article written. First of all, the main pros of having authors website itself is that you can adjust your WordPress Theme for blog needs. You can customize it exactly as you wish. 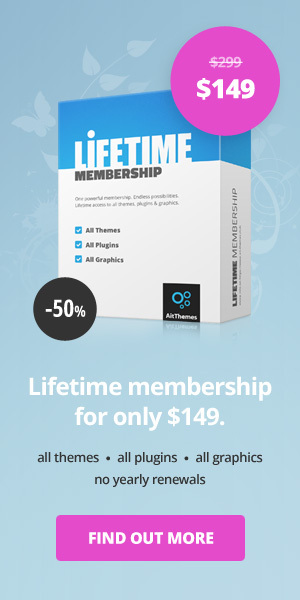 That’s a huge benefit comparing to blogging platform like Medium. In Medium interface you can’t make any customizations except of adding avatar to your profile, featured images to the articles and setting up the way, how are specific posts displayed. Also it’s more difficulty for your post to be found in Medium, because the competition is really big (thousands of articles are posted everyday!). But if you create blog by WordPress Theme, you have better default position for growing your blog and getting a higher traffic. WordPress was created primarily as a blogging platform and content management tool. Although it has a much wider use today, author blogs are one of the most frequently built types of websites. Many of them, however, only use the basic WordPress features and therefore cannot offer any added value to the bloggers. In addition, authors websites they are all very similar. When we started creating the Multi-Author Blog Theme, we wanted it to become one of the best WordPress themes for blog on the market. That’s why we’ve focused on creating unique features for bloggers. So if you’re looking for the best WordPress theme for blog, keep reading and find out every detail. Imagine you’d like to create WordPress blog – e.g. travel blog and you’d like to write about different places in the world. Wouldn’t it be great if your visitors were able to see immediately where you were on the map? And which places can they learn more about? Or, you plan to make reviews of restaurants or cafes in your town. How useful it would be for your web visitors to instantly find out where to have a good dinner and which restaurant is the best in their immediate proximity :). This is not just a nice fantasy. This is reality in our WordPress blog theme that is called Multi-Author Blog. This theme has special Extended Google Map Element which allows you (and other blog authors) to easily enter an address to each post based on which the GPS coordinates are automatically generated. Or you can enter the coordinates directly. Thanks to the exact localization on the map, there is a pin displayed on a single post page for each specific post. In addition, Post Markers appear in various website sections – e.g. when searching for posts by category, date or when clicked on an Author page (here the map shows all the posts of the author). More detailed information on Post Markers. Extended Google Map adds new opportunities for efficient use of WordPress Themes for authors & bloggers thanks to the post localization. This feature can be found only in our Multi-Author Blog Theme. How to add ads to WordPress blog? All author websites should have some marketing tools to maximize the profit of it. But only a few best WordPress themes for blog can provide these crucial tools. Multi-Author Blog Theme offers special element Advertising Spaces which enables the website administrator to easily add ads and banners (like Google Adsense and others). These can be inserted quickly and conveniently via Page Builder. Typical WordPress themes for writers usually work as a one man show – a personal, author website of one single blogger. But our theme expands the standalone WordPress blog to a live blogging portal where an unlimited number of authors can contribute. Build your own readers community around the world! 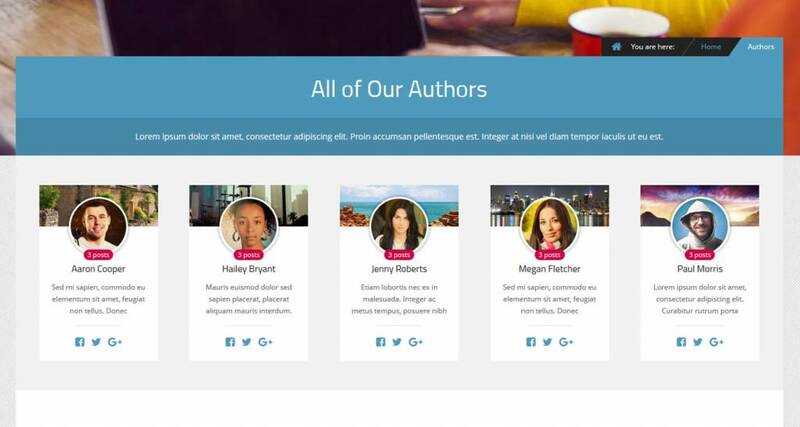 Thanks to our template, you can create not just an ordinary multi-user author website. You can use it to build a worldwide online magazine! Because, besides being a multi-user, it is also multilingual. This means that there is 26 language mutations available, giving you a lot of new opportunities. 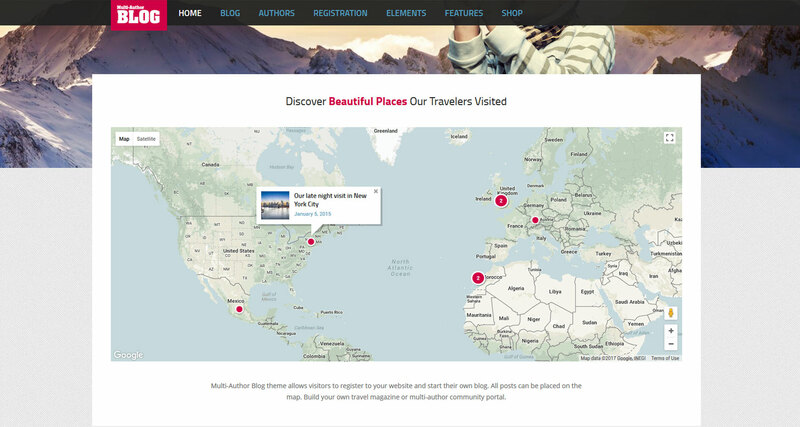 Thanks to the multilingual WordPress blog theme, you can attract bloggers from different countries. Because of this you will be able to provide a larger amount of unique content in all the most popular foreign languages. And you can also translate all the articles into multiple languages, which instantly increases the number of posts on your WordPress blog. This will immediately attract a great number of potential readers from all parts of the world. In addition, thanks to different keywords (and in different languages), users will be able to find you via Google easier. 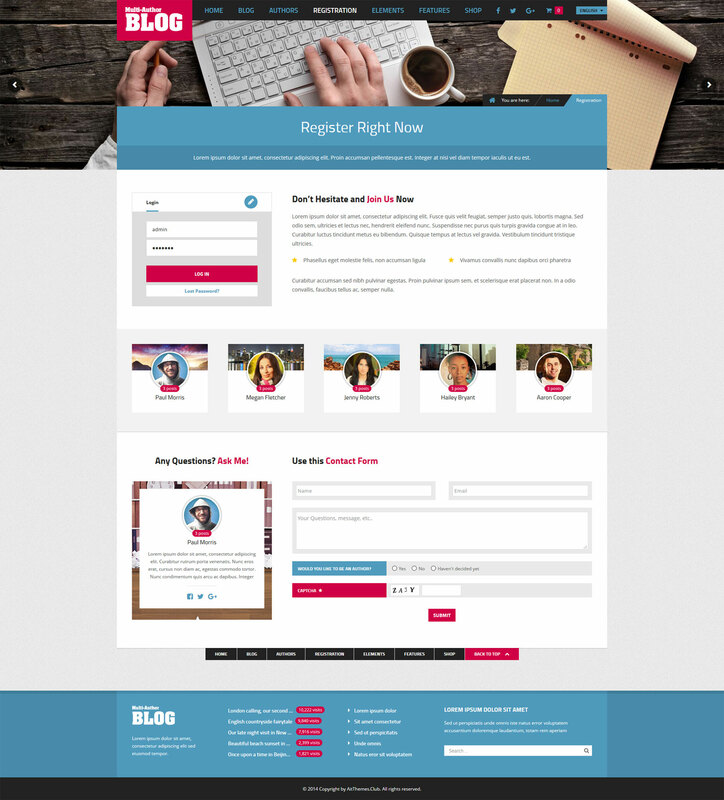 For registration of new authors in Multi-Author Blog, there is a custom Login and Register Widget available, where you can also design a separate Custom registration page for them. But what’s really special is the possibility of redirecting user to the Author’s welcome screen. What is it good for? This feature is designed to build good relationships with blog authors, helps to build confidence and creates a positive image of the blog. Common WordPress themes for writers do not provide a great degree of personalization of blogs for each blog author. But we think that all the blog authors are unique. 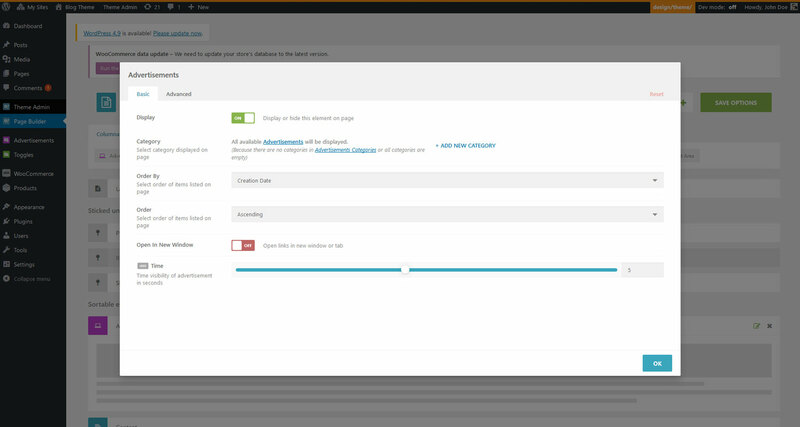 Therefore, there is an option within the account settings for bloggers to customize their personal blog as they want. E.g. write information about themselves, add a photo, set up any background or paste anything into their profile (via WYSIWYG editor). Thanks to this, authors can distinguish themselves from others, become more memorable for a regular blog reader and spice up the entire blog. Because each author’s website will be unique. If you have a WordPress blog, you want it to stay alive, so that there are posts added regularly. How to achieve this? Via our next unique feature – a tailor-made Authors Element. 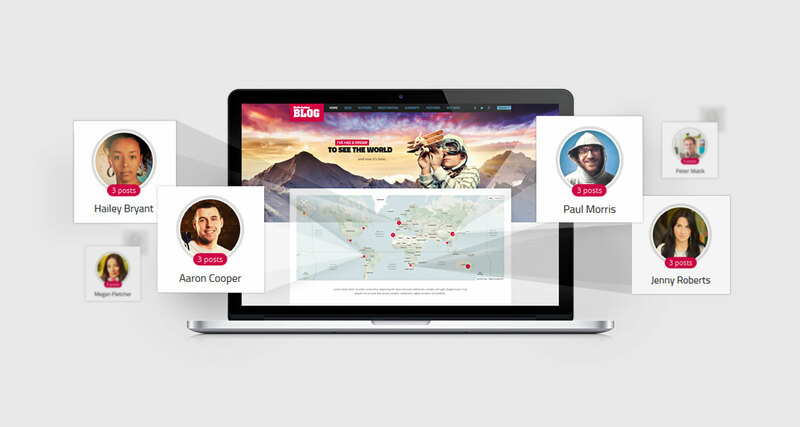 Authors Element allows you to display selected bloggers anywhere on the website. Their order can be set by the website admin. By setting exact rules (e.g. number of new posts added over a certain period, or ratings etc.) you can motivate blog authors to work harder and be more active. As an exchange for higher position in the bloggers list and better promotion on the blog. 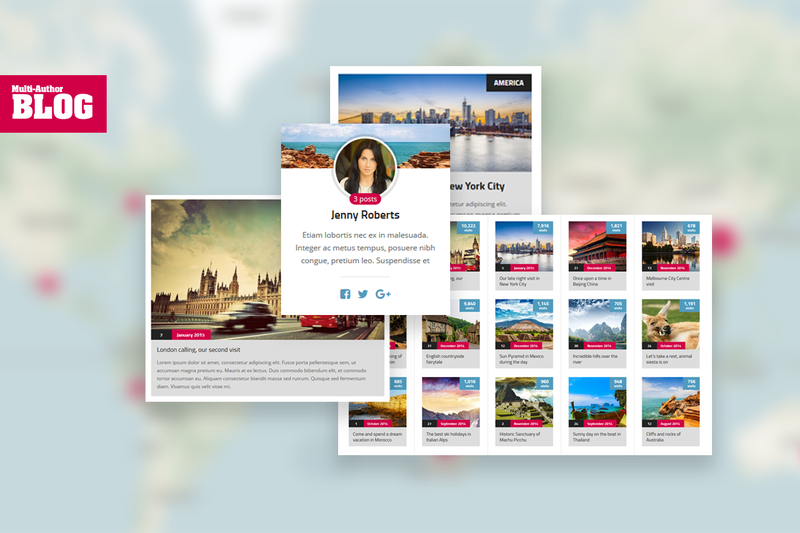 Most often, our customers design our template as a travel blog (see the examples in our showcase gallery). But our Multi-Author Blog Theme will help you to build any original author website. You can tweak it to any subject – travel blog, food blog, business blog, but also for example to a blog portal where blog authors will write about historical monuments, museums or even the most famous party clubs or fashion shows around the world. Since it really is a multi-purpose WordPress theme for writers, its use has no limitations. It’s up to you what kind of blog you choose! 1. Does Multi-Author Blog Theme allow addition of comments to individual blog posts? Yes. Blog admin can enable or disable blog comments at any time. 2. How can I avoid spam comments on articles? Captcha is used against spam comments and it can be activated by admin. 3. Is it possible to share individual posts of blog authors? Yes, social network icons area is automatically available for each blog post. 4. Is it possible to follow a specific blogger? No, currently it is not possible to follow authors via blog portal. Therefore we recommend that blog authors also include links to their accounts on social networks. 5. Is your template multi language? Of course. Our Multi-Author Blog Theme is multilingual ready. This means you can easily create many other language versions for your blog. The template and its settings are readily translated into 26 most widely used world languages – you just need to download AIT Languages plugin (if you have a Full Membership) or buy it as a standalone plugin. 6. And what about RTL languages like Arabian? Are these also supported by Multi-Author Blog Theme? No, the right-to-left languages are not supported. Buy Multi-Author Blog Theme along with all available plugins (including WordPress blog plugins) and 70 other great themes via Full Membership. Now for a special discounted price! This looks really amazing, great achievement guys! Keep moving. Laura Herman here with Click4Corp. We are a digital marketing agency and we are very interested in learning more about your map blogging platform. Please feel free to contact me at 469-441-4678 Ext 740.
thanks a lot for interesting in our Multi-Author Blog template based on CMS WordPress platform. Could this Multi-Author Travel Blog theme be modified for use in real estate? – Instead of travel locations use property addresses and show these addresses as pins on the map (homepage). – The “Multi-Authors” would then of course be individual real estate agents. thanks for asking and interesting in Multi-Author Blog theme. We are sorry, there is no such a feature that would allow modification of the theme in the administration in order to use it in real estate. It requires further theme customization.